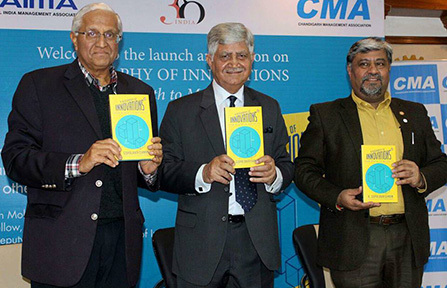 Chandigarh Management Association (CMA) hosted the launch of the book ‘A Biography of Innovations from Birth to Maturity’ authored by Mr. R. Gopalakrishnan, published by Penguin India at Rotary House, Sector 18, Chandigarh on 23rd December 2017. General V P Malik, PVSM, AVSM 19th Chief of Army Staff of Indian Army was the chief guest of the event. The talk was followed by a question answer session from the audience that comprised of approx. 75 CMA members.